The Smart Dilutor W offers an advanced automation solution to both gravimetric dilutions and liquid dispensing. 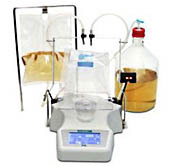 Adapted to dilute samples both within 400 ml and 80 ml bags, the device can process samples of up to 5 g with an error < 1% . It can drive diluent from both ready to use media bags and regular media ISO 4796 bottles. One and two pump units are available. The total amount of pumps can be increased to reach 6 pumps when using the 4 pump accessory, enhancing performance and enabling the use of multiple diluents. 5 levels of instability tolerance allow to operate the device on unstable surfaces such as laminar flow cabinets or workbenches where a blender might be generating vibrations.